if you follow me on pinterest (particularly my colorful amazingness board), or have just been following me for a good long while, you might be aware that i am very inspired and influenced by 20th and 21st century abstract/geometric art. i love learning about and enjoying that visual art subspecialty to enjoy the works as they are, but i also find there's a lot of fodder in the annals of that aesthetic to loosely inform an infinite number of my quilts or other artistic expressions. on the long list of artists whom i admire is the painter/printmaker frank stella. i love his exuberant use of intense, saturated color coupled with minimal form; the coupling creates a maximal visual impact. a couple years back i found a few books about him and his work at a local library, and fixated upon a series he did that included this work of his, concentric squares, that's has rainbow bands of color that in one half go from red to violet on one half, and bands going from violet back to red on the other half. very impactful in it's bold simplicity. very log cabin-esque, right?? of course. so i figured i'd make a quilt based off of this work (and the others very similar to it in his body of work), but in a way that suited me and my tastes: it's four giant log cabin blocks in a simple grid format, and there's some texture and visual interest in the way of the fabric choices, as i used dupioni silk for some of the concentric squares, and subtle striped and polka dotted fabrics for others. binding is a flaming hot pink dupioni. 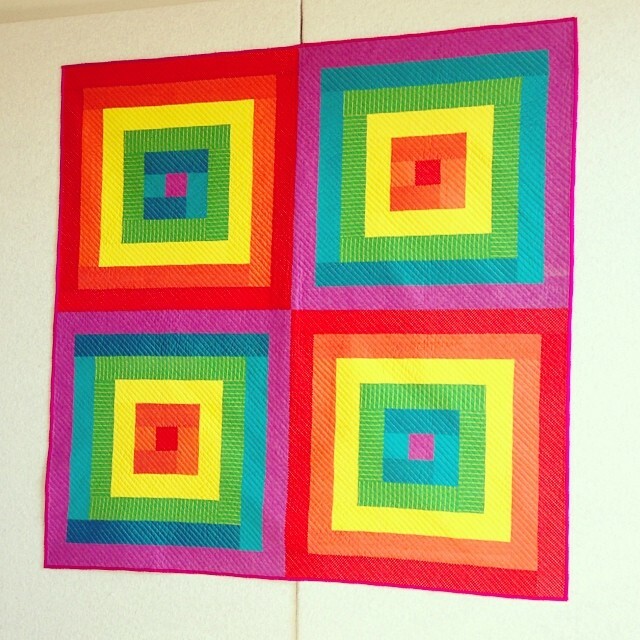 i did diagonal straight line quilting across the body of the quilt, in bright yellow 40wt. aurafil thread. 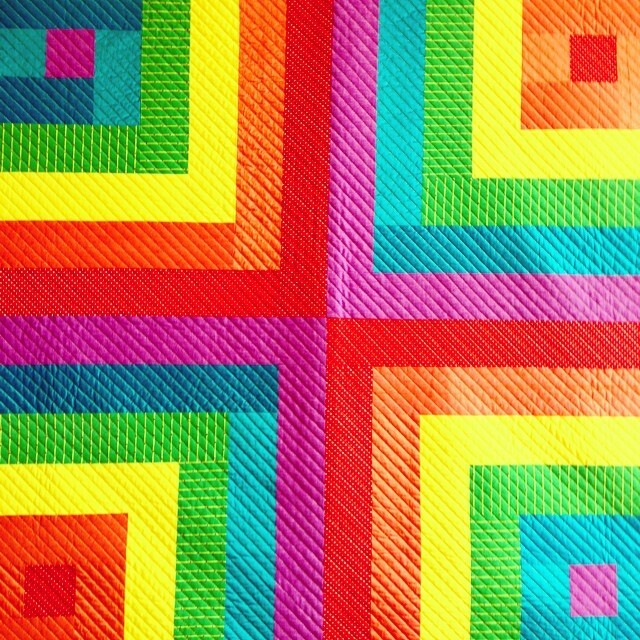 with regards to the quilting thread color choice: i've come to think of yellow as a great unifier, kind of a neutral, when quilting a quilt that's got a healthy amount of bright, saturated colors, often the best choice. using white or off white or something else just wouldn't work nearly as well, i'd posit, at least with this quilt. does your taste in art influence the quilts you make? in what way?